Citation: Pham TT, Chau SM, Ifegwu IO, Wang BY, Wong BJF (2018) Endoscopic Removal of Intranasal Supernumerary Tooth Presenting as Nasal Obstruction and Epistaxis. 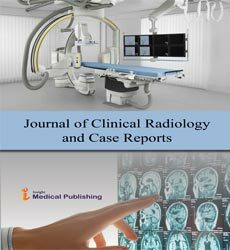 J Clin Radiol Case Rep. Vol.2 No.1:04. Copyright: © 2018 Pham TT, et al. This is an open-access article distributed under the terms of the Creative Commons Attribution License, which permits unrestricted use, distribution, and reproduction in any medium, provided the original author and source are credited. Objective: Supernumerary teeth, presenting in excess of normal teeth, are commonly found in the upper incisor area. However, supernumerary teeth appearing in the nasal cavity is rare and has primarily been documented through case reports. Here we present a case report of an adult patient with nasal obstruction, decreased sense of smell, and intermittent epistaxis, who was found to have an intranasal supernumerary tooth by computed tomography imaging and pathological confirmation. Methods: Case Report Results: Computed tomography imaging and endoscopic evaluation revealed a hyperdense mass in the nasal cavity. Pathology confirmed the presence of a calcified mass consistent with a supernumerary tooth in his nasal cavity. Following endoscopic extraction, the patient’s symptoms resolved. Conclusion: Supernumerary teeth should be considered on the differential diagnosis for nasal obstruction and be evaluated with radiology, endoscopy, and pathology to exclude serious or malignant conditions such as chondrosarcomas and osteosarcomas. Endoscopic removal of supernumerary teeth is safe and effective. Ectopic eruption of teeth has been described to occur in various locations including the maxillary sinus, orbit, and palate . Teeth causing nasal obstruction and drainage are a rare clinical entity and most cases have been reported in the form of case reports . This paper aims to contribute information regarding the presentation and treatment of teeth in the nasal cavity. Little is known about the origin of these teeth since there are few reports but, in most cases, surgical extraction has been an effective treatment. A 46-year-old male was referred by his primary care provider to otolaryngology specialists for complaints of nasal obstruction and difficulty in breathing through his nasal cavity. He also had associated right nasal and mouth discomfort, and intermittent epistaxis. For his symptoms, he was previously placed on ciprofloxacin and amoxicillin, as well as a nasal steroid spray. His past medical history was unremarkable, and he denied asthma, diabetes, coronary artery disease, or renal disease. He denies sustaining any nasal or facial trauma or foreign body placement. His only surgery was an open reduction and internal fixation for a broken left arm. His social history was unremarkable. On examination, he had a firm, fibrous mass along his nasal floor. 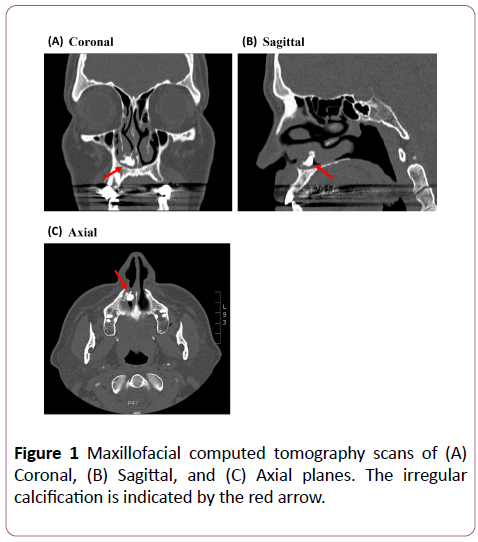 Computed tomography (CT) imaging revealed the presence of an irregular calcification of the right nasal airway at the level of the anterior aspect of the inferior turbinate that measured about 1 cm in size with a very complex shape (Figure 1). The differential diagnosis initially included supernumerary tooth, odontoma, inverting papilloma, rhinolith, osteoma, polyp, malignant mass, infection, foreign body, or a traumatic pyogenic granuloma. Figure 1: Histopathology of ovarian parenchyma with interspersed endometrial glands and stroma along with areas of haemorrhage. He underwent bilateral nasal endoscopy with excision of the right nasal mass and right partial inferior turbinate resection. In the right nasal vault, there was friable granulation tissue over a calcified mass medial to the right inferior turbinate, lateral to the maxillary crest. This mass was firmly adherent to the inferior turbinate. After excision, it was clear that the mass contained a small dense cylindrical central region with surrounding polypoid mucosa or granulation tissue. Pathology reports revealed a polypoidal structure with enamel and dentin tubules, consistent with a supernumerary tooth (Figure 2). Fragments of sinonasal mucosa and polypoid granulation tissue with extensive chronic inflammation were also noted. A Kotler airway was placed to facilitate nasal airflow during healing. 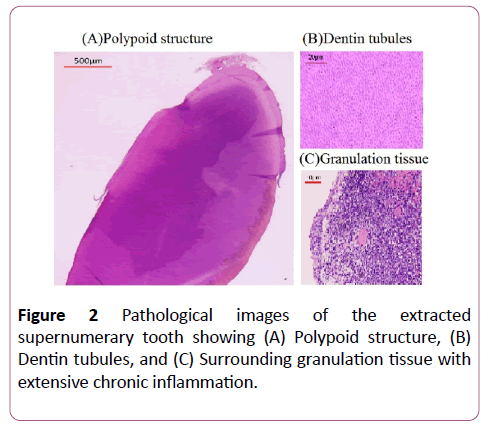 Figure 2: Pathological images of the extracted supernumerary tooth showing (A) Polypoid structure, (B) Dentin tubules, and (C) Surrounding granulation tissue with extensive chronic inflammation. He healed well and on postoperative day five, when his right-sided Kotler nasal airway was removed, he endorsed improved nasal breathing. On follow-up one month after surgery, his nasal obstruction had resolved with no complications. The differential diagnosis for nasal obstruction is wide and includes common diagnoses like foreign body impaction, nasal polyp, infection and tumors. Benign tumors include hemangiomas, osteomas, dermoids, and odontomas, and examples of malignant tumors include squamous cell carcinoma, adenocarcinoma, adenoid cystic carcinoma, melanoma, olfactory neuroblastoma, and may others. It is important to use diagnostic tools such as radiographic imaging, endoscopy, and pathology to help guide diagnosis and treatment, as well as rule out concerning malignancies. In cases where an intranasal radiopaque mass is found, the differential may narrow to focus on diagnoses such as foreign body; rhinolith; bony mass; calcified tumor such as chondroid tumor, fibro-osseous tumor, olfactory neuroblastoma, inverted papilloma, and odontoma; calcified neoplasm such as chondrosarcoma and osteosarcoma; or in this case report, supernumerary tooth. In contrast to odontomas, which are mixed benign odontogenic tumors divided into the compound type (formed by many small tooth like structures often held together by a capsule) and the complex type (a single amorphous mass of mature odontogenic tissue without structural organization), supernumerary teeth are teeth of normal composition presented in addition to the tooth set, both in the primary and permanent dentitions . In a few cases, teeth have been found outside the oral cavity with the incidence of supernumerary teeth in the general population being 0.1-1% [4-6]. Supernumerary teeth are more commonly present in the palate, maxilla, or orbit. However, the occurrence of intranasal teeth is rare, and literature is mostly limited to case reports and case series. Intranasal teeth have been diagnosed in all ages, ranging from young children to the elderly . Patients with intranasal teeth often present with unilateral obstruction and discomfort with some having serous or purulent rhinorrhea [2,8-10]. External deviation of the nose has also been observed as well as epistaxis, nasal septal abscess, paranasal sinusitis, and oronasal fistulas [11,12]. A few cases have been asymptomatic and found only through imaging [13,14]. On examination, an intranasal tooth may be seen as a white bony mass in the nasal cavity surrounded by granulation tissue and debris . Imaging modalities such as radiographs and CT scans may be used to further visualize the tooth. CT scans, especially may be helpful in evaluating the depth of the implantation site to further inform surgical planning. The etiology of nasal cavity eruption of teeth is not wellunderstood. Supernumerary teeth are more commonly related to the upper jaw, and these teeth develop either from a third tooth bud that arises from the dental lamina or possibly from splitting of the bud itself [4,15]. Some have proposed other pathologies including tooth displacement secondary to maxillofacial trauma, developmental abnormalities such as cleft lip or palate, or infection [2,11,15-17]. The development of an intranasal tooth after maxillofacial trauma has also been described [18,19]. Other proposed theories touch on crowded dentition, dense bone, or a genetic predisposition. Once identified, treatment of supernumerary teeth focuses on extraction of the tooth to avoid further complications. In children, it is suggested that the most appropriate time for extraction is after the roots of permanent teeth have completely formed to minimize the risk of negatively affecting tooth development [7,15,17]. In addition to removal, surgical methods should also evaluate the involvement of adjacent structures [11,14]. Common surgical techniques take transnasal and transpalatal approaches . Past cases, including this one, have utilized endoscopic extraction of nasal teeth which has been successful in children and adults [11,13,17]. Endoscopic extraction affords many advantages such as optimal visualization, good illumination, more precise dissection, and improved postoperative course [7,11,13,14]. In this case, as with other cases, patients have experienced full recovery with relief of their nasal obstruction [1,2,5,7,9,11-14,18]. Reoccurrence of aberrant teeth growth is uncommon . Although ectopic teeth in the nasal cavity are rare occurrences with few reports in the literature, they must be considered as a possible cause of nasal obstruction. Imaging and direct observation of the nasal mucosa are important modalities for diagnosis. Ectopic teeth may cause complications like infection, but most patients respond well to extraction and heal without reoccurrence of pathology. No funding sources were utilized for this research. Chamyal PC (1997) Intranasal supernumerary tooth. IJO & HNS 49: 54-56. Van Essen TA, Van Kijswijk JB (2013) Intranasal toothache: case report. The Journal of Laryngology & Otology 127: 321-322. Thawley SE, LaFerriere KA (1977) Supernumerary nasal tooth. Laryngoscope 87:1770-1773. Pippi R (2014) Odontomas and supernumerary: is there a common origin? Int J Med Sci 11: 1282-1297. Nastri AL, Smith AC (1996) The nasal tooth. Case report. Australian Dental Journal 41: 176-177. Chen A, Huang JK, Cheng SJ, Sheu CY (2002) Nasal teeth: report of three cases. AJNR Am J Neuroradiol 23: 671-673. Iwai T, Aoki N, Yamashita Y, Omura S, Matsui Y, et al. (2012) Endoscopic Removal of Bilateral Supernumerary Intranasal Teeth. J Oral Maxillofac Surg 70: 1030-1034. Gupta YK, Shah N (2001) Intranasal tooth as a complication of cleft lip and alveolus in a four year old child: case report and literature review. Int J Paediatr Dent 11:221-224. Smith RA, Gordon NC, De Luchi SF (1979) Intranasal Teeth. Report of two cases and review of the literature. Oral Surg Oral Med Oral Pathol 47: 120-122. Pracy JP, Williams HO, Montgomery PQ (1992) Nasal teeth. J Laryngol Otol 106: 366-367. Lee FP (2001) Endoscopic extraction of an intranasal tooth: a review of 13 cases. Laryngoscope 111: 1027-1031. Dhafeeri HO, Kavarodi A, Shaikh KA, Bukhari A, Hussain OA, et al. (2014) Recurrent epistaxis caused by an intranasal supernumerary tooth in a young adult. Am J Case Rep 15: 291-293. Kim DH, Kim JM, Chae SW, Hwang SJ, Lee SH, et al. (2003) Endoscopic removal of an intranasal ectopic tooth. Int J Pediatr Otorhinolaryngol 67: 79-81. Clementini M, Morlupi A, Di Girolamo M, Di Girolamo S, Ottria L (2012) Endoscopic Removal of Supernumerary Tooth from the Nasal Cavity of a child: a Case Report. Oral & Implantology 5: 21-25. Gulia J, Yadav S, Gupta A, Hooda A (2009) Intranasal tooth: Report of an unusual case and review of literature. The Internet Journal of Head and Neck Surgery 4: 1-4. Yeung KH, Lee KH (1996) Intranasal tooth in a patient with a cleft lip and alveolus. Cleft Palate Craniofac J 33:157-159. Lin IH, Hwang CF, Su CY, Kao YF, Peng JP (2004) Intranasal tooth: report of three cases. Chang Gung Med J 27: 385-389. Agrawal M, Khan TS, Gupta T, Khanna S (2014) Intranasal tooth: ectopic eruption 1 year after maxillofacial trauma. BMJ Case Rep.
Gilbride MJ, Smith WP (2005) Eruption of teeth in the nose following trauma to the primary and permanent dentitions. Br Dent J 198: 199-200. Sammartino G, Trosino O, Perillo L, Cioffi A, Marenzi G, et al. (2011) Alternative Tansoral approach for intranasal tooth extraction. J Craniofac Surg 22: 1944-1946.